The Drones for Foraging project spans speculative design, DIY, and design research to explore possible futures in agricultural technologies. Robotics and sensing technologies are common in industrial agriculture. Little attention, however, has been put towards the use of these technologies for small-scale or alternative forms of agriculture. Drones are a case in point-more and more drones are being used in industrial agriculture, but there is little design research exploring how drones might be used in other agricultural contexts. As DIY and hobbyist drones become increasingly accessible, they offer an ideal platform for such experimentation. Foraging is the activity of collecting edible fruit and vegetables from sites other than farms and orchards, such as collecting apples from trees planted in parks or mustard greens from abandoned lots. Foraging can be a way to supplement the local food supply by making use of fruits and vegetables that might otherwise go to waste. For instance, foraged apples can be donated to local food shelters to bolster the supply of fresh produce and contribute to the food security of a community. 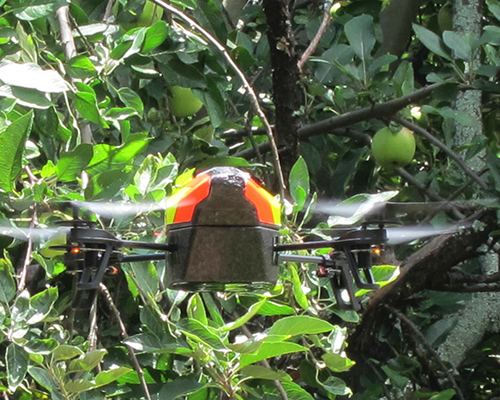 The problem of the Drones for Foraging project is to imagine, investigate, and prototype uses of drones and related technologies for this alternative agricultural practice, and to document and share that research-through-design so that it is available for others to build upon. The Drones for Foraging project would not be possible without ongoing insight from Concrete Jungle.